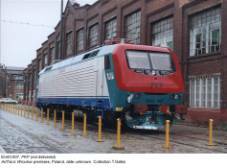 Pre-prototype of new locomotives intended for PKP: FS E412 013, location and date unknown. Photo from my collection. EU11-014, already in the PKP livery, photographed at the Wrocław Główny station, date unknown. Photo from my collection. EU43-007 at the ADDtranz premises in Wrocław, date unknown. Photo from my collection. 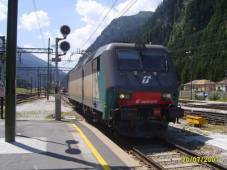 E405.036, FS, Brenner, July 20, 2007. Photo by Isenherz (Mark Handy) via Wikimedia Commons. 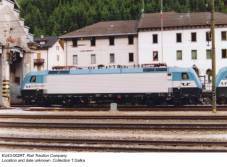 EU43 005RT, Rail Traction Company, January 28, 2005, location unknown. Photo by RTC via Wikimedia Commons. EU43 drawing, from Technika Transportu Szynowego vol. 12/1997. E405 029, Brennero, June 10, 2004. Photo by Ryszard Rusak (from my collection). Another picture taken on the same occasion: E405 012 (photo from my collection). EU43-002RT, RTC, location and date unknown (photo from my collection). 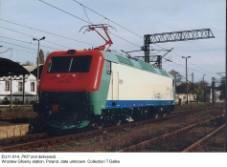 In 1996, ten years after the EP09 prototype made its appearance, PKP placed an order for new four-axle (Bo’Bo’) locomotives with the Pafawag company of Wrocław. The need for such machines was obvious, as well as the fact that existing designs had almost no development potential. Before serious design work could start, however, Pafawag became a part of the ADtranz concern. It was intended to purchase fifty machines. Forty-two EU11s (factory type 113E, 3kV DC) were intended mainly for the fastest passenger trains, while eight two-system EU43s (factory type 112E, 3kV DC and 15 kV / 16 2/3 Hz) were necessary for heavy international freight traffic, mainly to and from Germany. 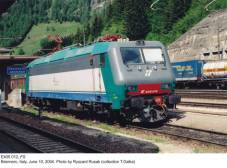 Both types were developed from class E412, designed in 1994 and built by ADtranz Italia of Vado Ligure for Italian state railways FS. Despite similar silhouettes and overall dimensions, they differed between themselves in many details, not only supply voltage: for example EU43 had cabs made of special plastic, while the body of EU11 was entirely of metal. Production involved components and sub-assemblies supplied by about 150 contractors from Germany, Switzerland, Austria, Italy and Poland, final assembly taking place in Wrocław. EU11, with the rated power of 6000 KW, was to haul 600-tonne passenger trains at 200 km/h or 800-tonne trains at 160 km/h – performance almost revolutionary by Polish standards of that time. It could also serve fast freight trains (140 km/h with 1200 tonnes or 100 km/h with 2200 tonnes). EU43 offered similar performance, with rated power reduced to 5600 kW in the AC supply regime. Not only their performance was to set a new standard in Polish railroad traffic, but also modern design, with state-of-the-art elements and wide use of digital and computerized systems, marked the beginning of a new era. And – last but not least – their slim, streamlined silhouette was completely different from everything we were used to. First tests of FS 412 003 in Poland started in late January 1998, with production at ADtranz Pafawag already under way. In order to speed up deliveries, first three EU43s were assembled at Vado Ligure; EU43-001 arrived in Wrocław for tests in June 1998. During these tests, on April 18, 1999, this locomotive set the new national ‘classic’ train speed record, attaining 222 km/h (Italian Pendolino attained 250.1 km/h on May 11, 1994). All EU11s were assembled in Wrocław. 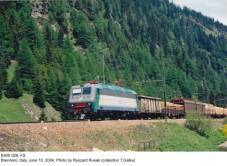 EU11-001 was outshopped in early 2000 and testing soon began, including service trials with fast passenger trains. Initial plans called for eight EU43s and twenty-four EU11s in 2000, with the remaining eighteen EU11s to be delivered between 2001 and 2005. However, in early 2000 orders were cut down. All EU43s were cancelled, together with seven EU11s. Production of both variants continued, however: last two-system locomotives were completed in late 2000 and finally all were sold to Italian private operator Rail Traction Company. 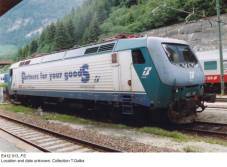 They are used mainly with freight trains between Verona and Innsbruck via Brennero/Brenner. Their class designation and service numbers were retained, supplemented with the ‘RT’ suffix. In mid-2002 PKP cancelled also the entire order for EU11s. All 42 examples were sold to FS Cargo and, after necessary modifications, impressed into service as class E405 intended mainly for freight traffic. First two 405s were dispatched to Italy in June 2003. 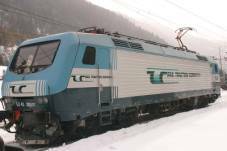 During the 2004/2005 winter several E405s were leased to Trenitalia, as class E635 locomotives used by this operator with express trains suffered from low reliability. There were rumors about delays of the program, but without doubt the cancellation was caused by financial problems experienced by PKP. Although both EU11s and EU43s made a number of test rides and on occasions ran with scheduled trains bearing the PKP designations, they were never actually included into company rosters and remained the manufacturer’s property. I feel, however, that they deserve an entry here, as they were ordered by Polish state railways in the first serious attempt of a substantial qualitative improvement. Class designation EU43 was later assigned to six TRAXX F140MS locomotives from Bombardier Transportation (which had absorbed ADtranz Pafawag), leased from Angel Trains Company in late 2007. Similarly, EU11 designation was assigned – albeit only formally – to sixteen class 163 locomotives, leased by Przewozy Regionalne from ČD in 2012. - Od Pafawagu do Bombardiera by Ryszard Rusak (EMI-Press).